I long for a luxurious mansion with a beautiful landscaped garden and a magical fish pond. Nestled in a secluded corner of my garden; my fish pond is filled with pretty colourful fish. I see magical creatures fluttering by; coming out to play only at night by a mere whisper of my unspoken thoughts. My garden is my secret hide-away; a tranquil haven I escape to whenever I'm feeling blue and need to de-stress. In the still of the night, I sit on the garden bench by my magical pond and throw in a lucky penny; hoping the Wishing Fairy hears my thoughts and grants my wish. Naturally, I'd tend to my garden every day; ensuring all my Garden Landscaping needs are met by superior quality products and professionals. For starters, I'd select a store like Wickes, which offers an expansive variety of products, garden accessories, garden buildings, garden tools, pond décor plus tips and advice on how to maintain the best garden in my neighbourhood. I can order everything I need by phone and book a design consultant too should I require one. I want a garden with a nice pool to destress too!! =-O =-O =-O LJ Meow 1! OMG, Mariuca! 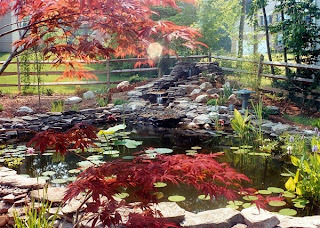 When I first seen that pond pic, I thought of a world aquarium. Hence, the profile pic on JSK and Twitter with the Dallas World Aquarium in it. On the lower of the place is a pond that looks nearly identical to the pic you have here. Relaxing would be an understatement to describe it for sure, and I agree with everything you say here! Nothing wrong with a healthy imagination. Your garden and fish pond sound heavenly. I would like one of those too.